Having restarted time, Rick, Morty and Summer are in a quantum-uncertain state of existence. 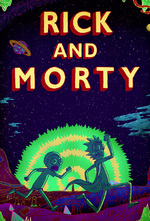 An argument between Morty and Summer leads to the creation of two alternate time-lines, which need to be stitched back together fast if the three/six of them are escape quantum collapse. Will Rick manage to pull Schroedinger’s cat out of the hat? I remember when Futurama thought they were the show for math/physics nerds. This program is the apotheosis of television, if not western civilization. I didn't realize how badly I missed this show until time split in four and the Ricks started shooting at each other. I was laughing so hard I had to pause it so I wouldn't miss more jokes. Fantastic start to the season. The leaked episodes, iirc, have the season one intro. The new credit sequence is pretty cool. Any time a show runs with its continuity, it gets extra bonus points, hence the fact that this episode is an immediate extension of the events of the last was excellent. This may have been the kindest thing that Jerry has ever done on the show. It helped that he had a romantic and selfless act that wasn't spontaneously ignited by a vision of a life of drugs and OJing it down the highway under the shadows of Los Angeles traffic helicopters. I was half expecting the deer to be immediately shot upon recovery, but the show has enough heart to not go down that road, apparently. The main Rick and Morty and Summer storyline was great and well executed. I'd like to think the conclusion implied that Summer will be joining the pair for more adventures, if not as a new permanent member. Given the use of time and space in the show, I'm officially waiting for a TARDIS to appear at some point in the background. Real question: Would Rick have saved Morty if Rick was first season first episode Rick? Was it Rick's evolution as a character concerning his love for his grandson what drove him to dive after him or can we grant Rick the basic empathy of one family member for another? Sooo gooood. Although I kind of felt sad we watched it as a leak, it felt like cheating. It was nice to at least get the surprise of a new credits sequence last night. I think this is the first time I've watched broadcast TV in months. When Rick is diving through spacetime about to disappear and says, "I'm OK with this," and then sees the broken collar and goes, "Oh god! I'm not okay with this!!" and starts scrambling for it, it struck me as one of the most fundamental human moments I've ever seen on TV. I don't know why it hit me so hard...but that vacillation was like an update of the serenity prayer for modern times, to me. And when he's seesawing between bargaining with god, cursing god and crowing about the nonexistence of god...ahhh!! So great!! And when he gets out his whiteboard to demonstrate to his grandchildren how useless he thinks they are...I feel like "Actually let me get out my whiteboard" is going to be a catchphrase in our family for a long time to come. Atreides, I don't think S1:E1 Rick would have saved Morty. I think Anatomy Park Rick or later *might* have. I think Rick Potion #9 or later almost definitely would. This may have been the kindest thing that Jerry has ever done on the show. I'm kind of liking that Summer is getting a more active role in her relationship with Rick- especially considering that this was my favorite scene from last season. "I vill mess with time...I vill mess with time!" Rick and Morty was one of the 18 shows with new episodes you should be watching article on Vox today. I thought for sure that the print of frames from The Horse In Motion that hangs in the Smith's foyer was a reference to the split-screening later in the episode. But, sure enough, it appears in the first season (at least as far back as Anatomy Park, possibly earlier) so either it's happenstance or Harmon/Roiland are playing the long game. Someone from Reddit merged all the splitscreens back together. That is some commitment to foreshadowing, figurant. Well hey she is a horse surgeon. Now I kind of want the print for my house tho. I read somewhere that the Horse in Motion picture was actually a tribute to animation itself, as that set of pictures was to prove that all of the horses feet were off the ground at some point while running. When the pictures were flipped through like a flip book, it made it look like a movie. That merged version makes the gunfight even more impressive. Am I the only one who realized "Testicle-Head" was a Langolier with arms and a shirt? My favorite quote: "Can somebody just let me out of here? If I die in a cage I lose a bet."